Kaspar the Friendly . . .
Kaspar Kummer is back. This 19th-century composer is so obscure, he is missing from even the most detailed music history books. But Red Cedar loves his chamber music & we were determined to give him a come-back. We find his music charming and invited some of our favorite period-instrument players to join us. 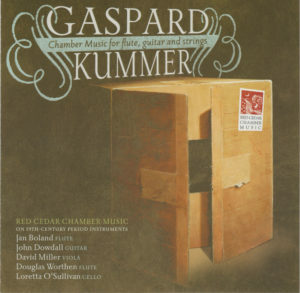 –– a compact disc recording of Kaspar Kummer’s music released in March, 2011 by Fleur de Son Classics of Buffalo, NY. 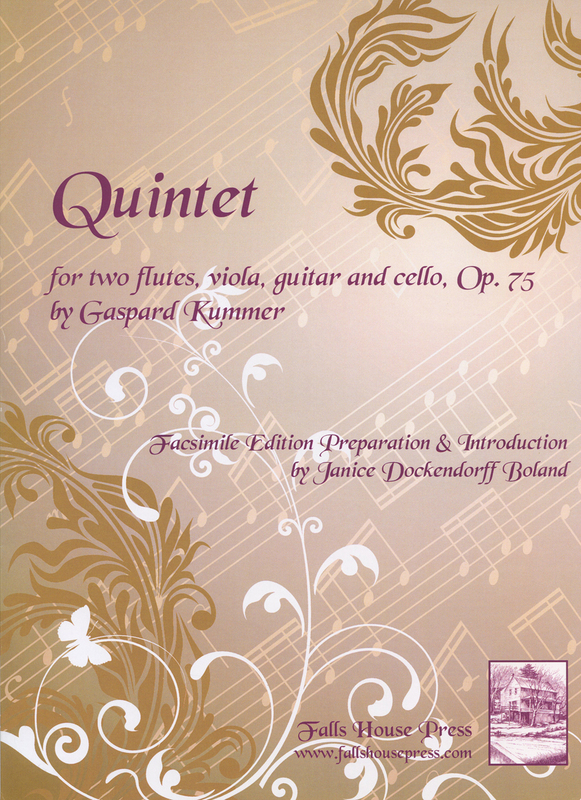 –– an edition _ facsimile prepared by Janice Dockendorff Boland __ of Gaspard Kummer’s Quintet Op. 75 published by Falls House Press/Theodore Presser (Item Number: FH0388). 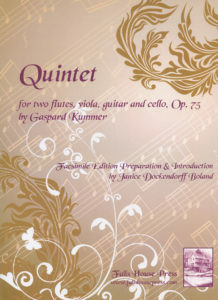 An edition _ facsimile prepared by Janice Dockendorff Boland __ of Gaspard Kummer’s Quintet Op. 75 was published by Falls House Press/Theodore Presser (Item Number: FH0388). All artists are period instrument specialists. For this project, they performed on period instruments (not replicas) from the early 19th-century. Jan Boland, flutist and co-founder of Red Cedar Chamber Music, has appeared in concert at festivals in Europe, Canada and the U.S. Her concerts and recordings feature musical interpretation on both modern and historic 19th-century flutes. The National Endowment for the Arts awarded Boland a Solo Artist Fellowship. Her Method for the One-Keyed Flute is published by University of California Press. She holds a Doctorate in Musical Arts from the University of Iowa. 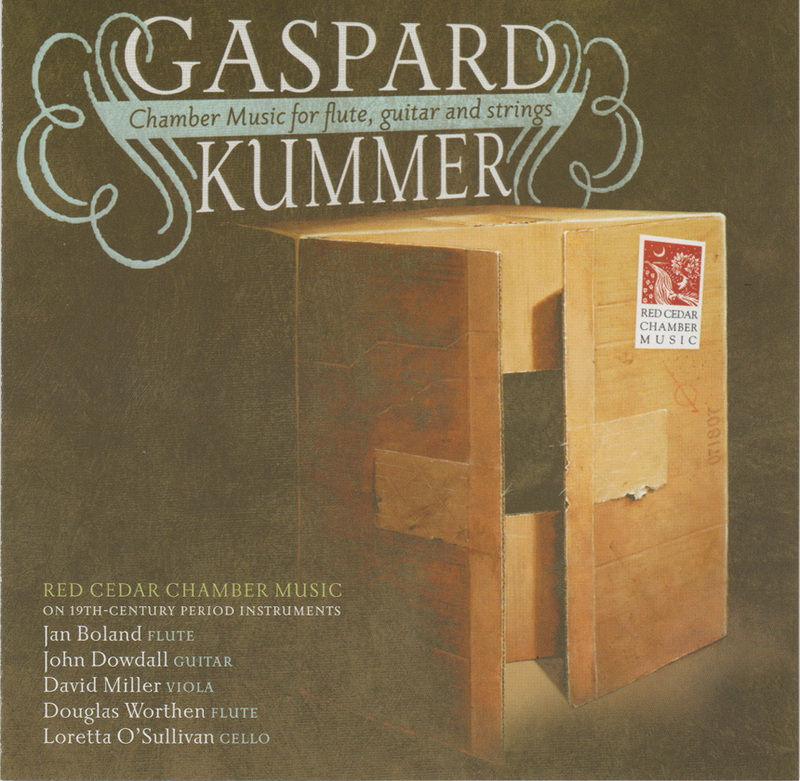 John Dowdall, guitarist and artistic director of Red Cedar Chamber Music, studied guitar performance at the University of Minnesota with Jeffrey Van and at the Hochschule für Musik in Vienna. He was awarded a Solo Recitalist Fellowship by the National Endowment for the Arts and holds a Master’s degree in musicology from the University of Iowa. His arrangements of music for flute and guitar are published by ALRY. Flutist Douglas Worthen has recorded with the Handel and Haydn Society and the Mannheim Quartet. His recording of works by Sigfrid Karg-Elert has received critical acclaim. Worthen has performed as soloist in Switzerland, Japan, France, Canada, Russia and the Netherlands. In 2004, he was awarded an artist fellowship from the State of New Hampshire. Dr. Worthen was appointed to the faculty of Southern Illinois University Carbondale in 2008. Violist David Miller has served as principal violist for numerous Baroque and Classical orchestras including the Boston Early Music Festival, the Handel & Haydn Society of Boston, the New York Collegium and the American Classical Orchestra. 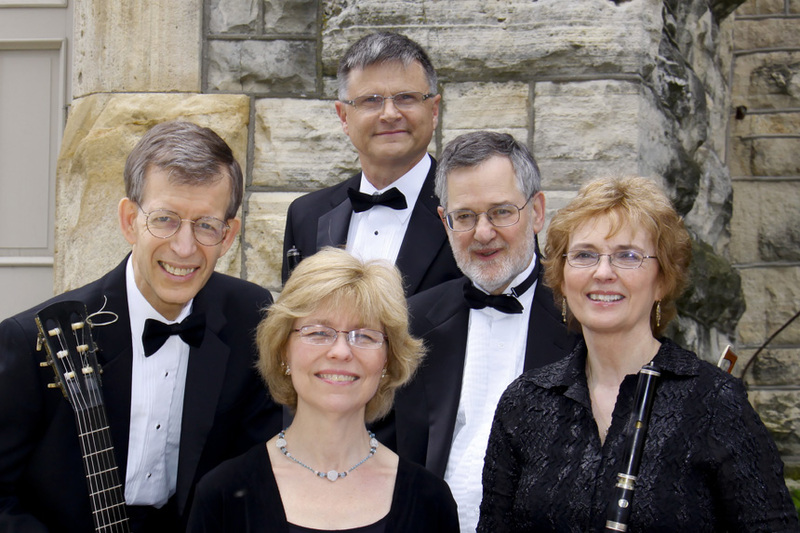 Chamber music affiliations include the Red Cedar Trio, the Classical Quartet, Aston Magna, the Bach Ensemble and Concert Royal. Mr. Miller holds degrees from Oberlin College and the Juilliard School. Loretta O’Sullivan, cellist and baroque cellist, plays solo, continuo cello and chamber music with many of this country’s leading ensembles and orchestras, including the Four Nations Ensemble, Opera Lafayette, Aston Magna, The Grand Tour and the Bach Choir of Bethlehem. She can be heard on numerous recordings with the Haydn Baryton Trio, the Classical Quartet, the American Bach Soloists, the Apollo Ensemble and Red Cedar Chamber Music. • August 22, 2010. Opening night concert of the British Flute Society International Convention. Manchester, England. 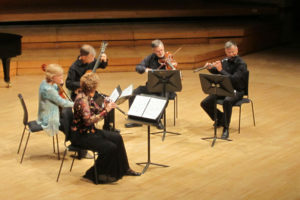 Red Cedar Chamber Music was invited to perform on the opening concert of the British Flute Society’s 7th International Convention in Manchester, England on August, 2010. Pictured above are the artists in concert at the Convention performing Kummer’s Quintet Op. 75. Given the quality of his music and the high esteem in which he was held by his contemporaries, I am surprised that today Kaspar Kummer is largely ignored. Indeed, ask any musician working today if they know of Kaspar Kummer, and you may find that only flutists and pianists (they play his studies) know his name. His biography does not appear in leading music dictionaries, and information printed about him is largely taken from the account of his life and works found in Richard Rockstro’s The Flute (1890). According to Richard Rockstro (The Flute, 1890) we can count Kummer among the most important 19th-century composers for the flute. Rockstro writes “I know of no composer of music for the flute, whose works are of such uniform excellence as those of Kaspar Kummer.” He continues saying, “His music had finesse, elegance, and noteworthy clarity.” Kummer, Kaspar (or Caspar or Gaspard) (1795-1870) was a German flutist, teacher and composer. Mr. Rockstro gives a brief account of his life saying he studied and played several musical instruments before following Louis Drouet as first flutist and then Kapellmeister of the Castle Chapel of Herzog Ernst I of Coburg-Gotha. Here he developed his reputation as a renowned virtuoso and teacher. He composed a large body of chamber music works, including two Serenades (Op. 81 and Op. 83) for flute, viola and guitar and a set of three. Divertissement Op. 92 for flute, violin and guitar. Kummer played a flute with 8 keys and small tone holes which, at this time, was the popular system of flute in Germany. Playing his music on this flute is perhaps the way to hear Kummer’s music at its best – the sweet tone and subtle expression of the eight-keyed flute lends itself beautifully to this music. “Red Cedar has always given excellent performances, but this evening’s concert has been outstanding! Kummer’s music is an ‘awesome find’. BRAVO!” A.H .
“Elegant, filled with spirit. The artists’ enjoyments are contagious and uplifting- and, as always, Red Cedar keeps reaching to enlarge its repertoire, keeping their music fresh. Fresh is a good word for it all.” T.M. “All five of you put your body and soul into the music and become one with it – I will relive that as I listen to your upcoming CD.” E.P. “Thanks for bringing us Kummer – such lovely music and beautifully (and lovingly) performed. This CD will be a must for me.” W.S.